Fill a big stockpot with 16 cups cold water and add beef. Bring to a boil, skimming off impurities and add garlic, spring onion and 1 tbsp salt. Reduce heat and simmer for about 1½-2 hrs. Remove meat from pot, let chill and cut into thin slices. Set aside. Cool the stock to room temperature or lukewarm (should have about 12 cups of stock). Add in 2 tbsp salt, soup soy sauce, sugar and soup mix from naengmyeon noodle packet. Place in the fridge or in the freezer so that it is lightly frozen (but still liquid). Add salt to radish in a small bowl. Leave for about 15 mins. Drain out water and add the remaining ingredients, leave to pickle for at least 1 hr or overnight. Cook noodles in a pot of boiling water for about 3 mins or until the noodles are still al dente. Drain noodles and rinse thoroughly with cold water to remove excess starch. Place 1 serving of cold noodles in a bowl. Ladle 2-3 cup cold soup over the noodles. Top with cucumber, pickled radish, egg, beef slices and pear slices. Garnish with shredded nori, sesame seeds and spring onions. Repeat for other servings. 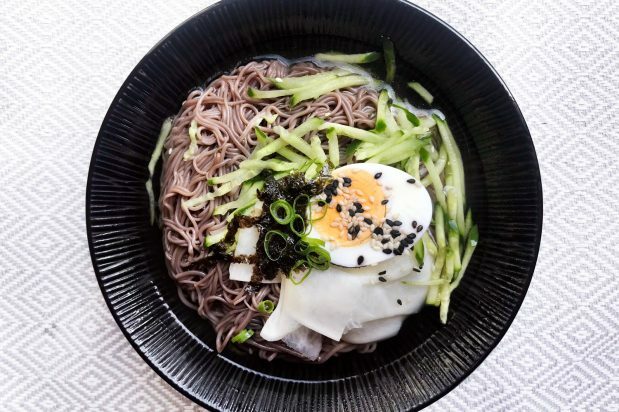 Serve naengmyeon with vinegar and hot English mustard mixed through according to taste.